I was excited to read this book since I am very interested in bioinformatics and punk (although the book has nothing to do with punk music). Although I wouldn't call myself a practitioner of do-it-yourself (DIY) biology, I do work for a very entrepreneurial bioinformatics and software company. 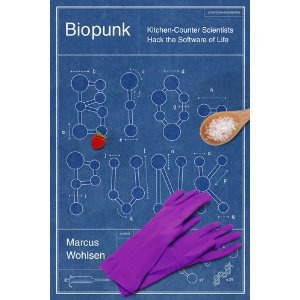 The general theme of Biopunk, by Marcus Wohlsen, is that we are arguably reaching a point in biotechnology similar to where computing technology was in the 1970's. That is, where the germ of successful companies can grow out of innovations by a handful of people working on a shoestring in garages and basements. Think about Steve Jobs and Steve Wozniak starting Apple in their garage, or Bill Gates and Paul Allen starting Microsoft while barely 20 years old. 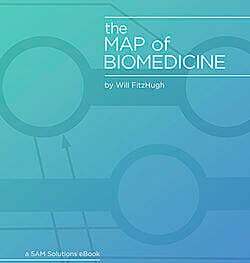 The point, echoed by many of the people who show up in the book, is that until recently biotechnological innovation has been only accessible to scientists at commercial companies or in academic labs. Wohlsen introduces the reader to some really interesting characters who want to get biological innovation out of the traditional places. There is a 23-year-old who, upon learning that her father has an inherited blood disorder, creates a genetic test for it in her kitchen so she can see if she has the associated genotype, too (she does). There are a couple of guys creating a do-it-yourself PCR testing machine they can take into the South American jungle to test for infectious agents that are affecting the local population. There is a bioinformatics professional who tests his own blood (albeit through an established lab) to see how well folic acid might help him ward off a disorder that causes blindness (for which his 23andMe test showed he had a high risk). I'll admit to being unsure about how far we are away from people in garages doing genetic engineering and competing with established companies and academics. Wohlsen presents both sides well, although he pretty clearly favors the do-it-yourself crew. My personal guess is that we are still far from understanding how our genomes are interpreted to create whole organisms. It's like having the source code for a piece of software but not a compiler or debugger. I'll bet we are decades away from people, whether they are in sophisticated labs or garages, creating genetically new organisms by anything other than essentially trial and error. Regardless, the stories in the book are thought-provoking and really show what ingenuity people are bringing to bear on biological problems. However, there is are a few too many hyperbolic statements and other quirks in this book for me to strongly endorse it. There are trivial issues, like when he drops a reference to the classic sci-fi move Blade Runner, saying "synthetic humans shop seedy storefonts for new body parts." I'm pretty sure that never happens in the movie (the replicants go to labs making body parts, but only to get information). There are amped-up and somewhat misleading statements about evolution: "After all, even God has one [a PCR machine] in his toolbox" and "... somehow leapfrog the sheer ingenuity of natural selection ..." The whole point of natural selection if that it doesn't have to be ingenious; the process selects for the best random changes. There are scientific inaccuracies, such as when he refers to genomewide association studies as looking in "areas where researchers had some reason to believe the trait and the gene would be linked" when the whole point of such studies is that they don't pre-identify any specific regions of the genome. And he writes that "strawberries are stuffed with DNA" because they have eight copies of their 200 megabase chromosomes while humans have two copies of three gigabase chromosomes (six billion base pairs in a human cell is more than 1.6 billion base pairs in a strawberry cell). There are also some places where the organization of the book needs a little work. He tells of a New Zealand academic researcher who dies of being infected with a bacteria she was researching, but ends the chapter with it and doesn't draw any conclusions. It's an academic lab, not a DIY one, so not clear how the story is relevant. He also tells a story of a woman demonstrating extracting plasmids from yogurt-making bacteria at a DIY bio event, but never tells us how the experiment ends up and how she demonstrates the results. The chapter leaves her before she finishes and ends with some DIY bio generalisms ("... if innovation emerges from the ground up, then perhaps its benefits will come more quickly to those at the bottom"). I had written this book, I would have asked the woman who tested herself for her own genetic traits if she had tested it on other people as negative and positive controls (like her father) and if she had repeated the test to make sure she got the same results every time. Maybe I'm being too critical of stylistic and technical issues, but there are other writers, such as James Gleick, Richard Dawkins, and Matt Ridley, who can take complex scientific topics and turn them into books that hang together thematically and tell complete stories. Biopunk has tons of good raw material and no end of interesting stories (bridges made of trees, a lab engineering bacteria to produce malaria medicine, etc.) but not all of them seem relevant to the main thrust of the book (that malaria lab is a commercial ones, not DIY). If Wohlsen had expanded his book to cover more territory and taken more care to weave these stories together, it could have been a powerful summary of current trends and future predictions in biotechnology. Symbolically, the book ends with a missed opportunity. Wohlsen makes a reference to southern California DIY-friendly alternative band The Minutemen, saying "their songs have penetrated pop music's DNA." But he misses a great opportunity to quote a lyric from their song "History Lesson - Part 2" -- If you're writing a book called Biopunk, the line "our band is scientist rock" would have been a perfect closing line.